A new exhibition at Huddersfield Art gallery explores the history and legacy of the women’s liberation movement of the 70’s and early 80’s. The exhibition runs until the 19th September 2015. 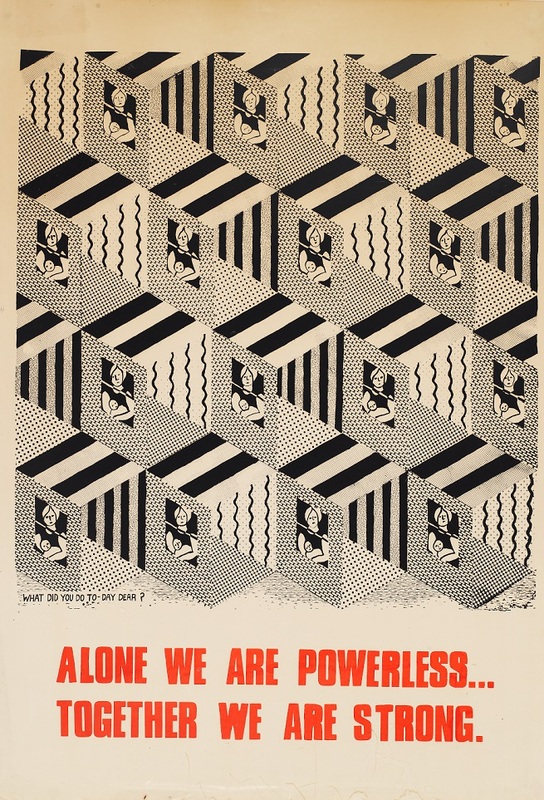 The See Red Women’s Workshop produced posters, illustrations, and printed documents for the women’s liberation movement. 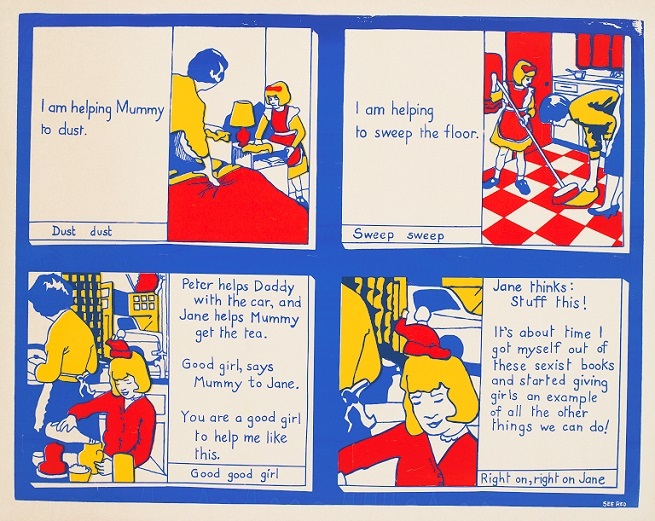 The posters explored the personal experiences of women including housework, childcare, sexuality and women’s role in wider struggles for change. The collective’s aim was to challenge the negative impact of female stereotypes and to promote women’s empowerment. The display at Huddersfield Art Gallery includes a selection of posters and archive material produced and documented by the collective. The exhibition explores both the history of the workshop and its legacy today. The workshop was founded by three former art students in 1974. They met through an advertisement placed in the radical feminist magazine ‘Red Rag’. Working together was important to See Red, as was sharing skills and knowledge. The workshop was based in squats before eventually settling in derelict premises in South London. There were usually six women in the collective at a time, but in total over 35 women worked with See Red. The posters were sold worldwide through mail order, bookshops and conferences. They got equipment and inks from firms that were closing down, or through donations. 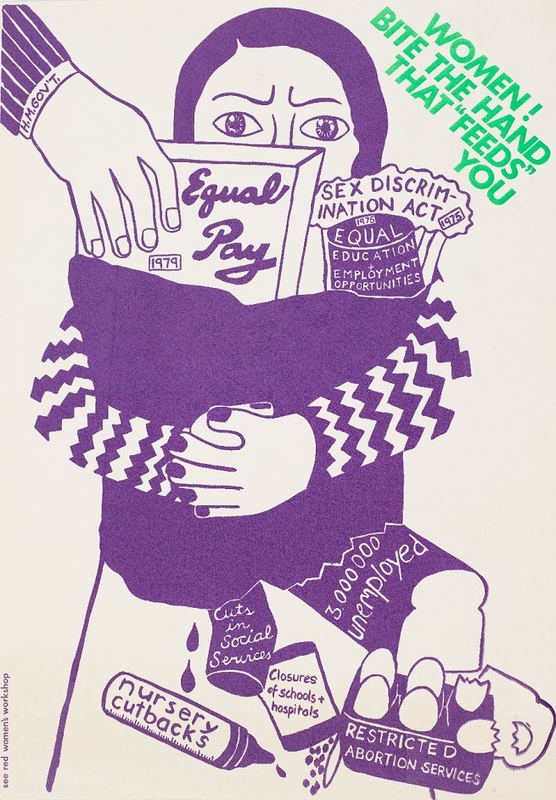 After 1983, the workshop focused on service printing and designing posters for women’s and community groups. Although no new See Red designs were created, the original posters continued to be printed and sold. In addition to the exhibition there will also be an opportunity for women’s groups and refuges to create a political poster, at an event on Tuesday 21st July 2015, from 1pm to 4pm at Huddersfield Art Gallery. Artist Paula Chambers will also be holding a workshop on the objects and imagery of the suffragette movement on Weds 5 August, 1pm – 3pm. The event is at Huddersfield Art Gallery and is open to anyone who is interested in finding out more about the West Yorkshire Women’s movement.